Yellow Tough scales cover the sturdy body of this POK�MON. Ruby/Sapphire NIDOQUEEN�s body is encased in extremely hard scales. It is adept at sending foes flying with harsh tackles. This POK�MON is at its strongest when it is defending its young. Emerald It is adept at sending foes flying with harsh tackles using its tough, scaly body. This POK�MON is at its strongest when it is defending its young. Leaf Green Its hard scales provide strong protection. 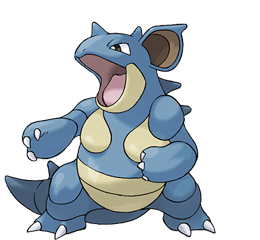 It uses its hefty bulk to execute powerful moves. Diamond/Pearl Its entire body is armored with hard scales. It will protect the young in its burrow with its life. Platinum Its entire body is armored with hard scales. It will protect the young in its burrow with its life. Heart Gold Its body is covered with needle-like scales. It never shows signs of shrinking from any attack. Soul Silver It uses its scaly, rugged body to seal the entrance of its nest and protect its young from predators. Black Its entire body is armored with hard scales. It will protect the young in its burrow with its life. White Its entire body is armored with hard scales. It will protect the young in its burrow with its life.